Every year, Cars.com editors drive hundreds of new cars from across the auto industry. Among this swath, dozens of models are all-new or redesigned for the current model year, and for the past 10 years, we’ve been naming our favorite car from that crop. We base that award on the car’s quality, innovation and value — against its competitive set, of course, but also in terms of how much it raises the bar in those areas across the industry. First up is the Genesis G70. All-new for 2019, the G70 sports credible road manners, pairing quick-ratio steering and rear-drive balance with a pair of turbocharged engines. And all that drivability accompanies a straightforward interior with ergonomic controls, plenty of driver-accessible storage space and a big, intuitive touchscreen. Next was the Honda Insight, a car reborn as a conventional-looking compact sedan with unconventional EPA-estimated gas mileage as high as 52 mpg combined. Such fuel-sipping ways don't come at the expense of acceleration, ride quality or comfort. Unlike its forebear, the Insight gives up nothing to its competition, including the entrenched Toyota Prius. Our third nominee was the redesigned Hyundai Veloster, a car that doubles down on the funky design of its predecessor while delivering performance that any sports compact enthusiast could love. The optional turbocharged 1.6-liter four-cylinder engine gives it some zip in the city, and both transmission choices -- a six-speed manual and a seven-speed dual-clutch automatic -- impress. Next up was the redesigned Jeep Wrangler, a late addition for the 2018 model year that fell into this year’s voting. The redesign is a massive improvement on the old Wrangler: Jeep has removed a lot of the obstacles to ownership, but the engineers haven’t nerfed it into being another soft-roader crossover. You can still remove the doors (which are lighter than ever) and drop the windshield for the most alfresco driving experience short of an all-terrain vehicle. Our fifth nominee was the Toyota Corolla Hatchback, a quantum leap ahead of its Corolla iM predecessor. The new Corolla Hatch is truly desirable, with strong safety, drivability and value. Boring had become a synonym for Corolla. This car changes that completely. Our final nominee? The Volvo XC40. Volvo gave its tiniest SUV clever details and packaging, plus something rare among premium models: value. And for all its spunky style, the XC40 sticks to its core mission of practicality, with improbably vast storage and cargo space. 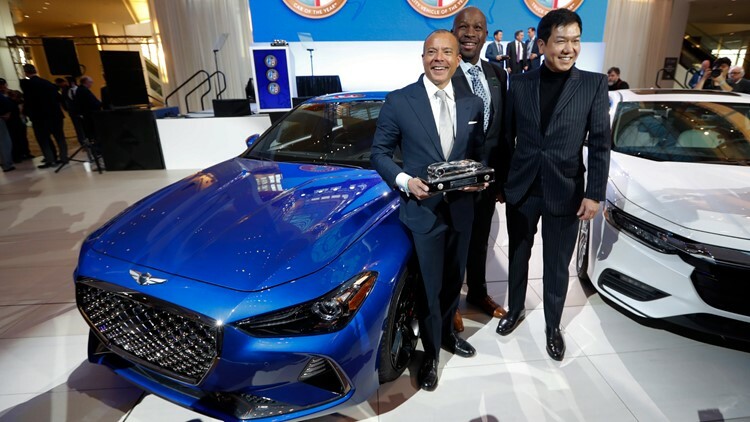 Manfred Fitzgerald, Executive Vice President & Global Brand Head of Genesis Motors, holds the trophy for the Genesis G70 winning the North American Car of the Year award during media previews for the North American International Auto Show in Detroit, Monday, Jan. 14, 2019. After plenty of deliberation, our Best Of 2019 car was the G70 — a clear choice for driving fun and relative value. This is as standout a choice as we’ve had in years, and the fact that it comes amid consumers’ preference for SUVs, says something of the headwinds the G70 faced in earning Cars.com’s top award. It stormed through, and then some.